From 2011 to 2016, 80 schools took part in our Solar Schools project to crowdfund the cost of their own solar roofs. Together they raised over £700,000 and installed over 2000 solar panels. The school teams worked their socks off to get their solar roofs, collecting donations from far and wide. From the 30p spent at a cake sale to the businesses giving hundreds of pounds - every generous donor owns a little part of the solar roof that they helped fund. 10:10 and each school would like to thank these donors for their support and lovely comments. Take a bow. Generous Brits have donated £500,000 for solar on schools! 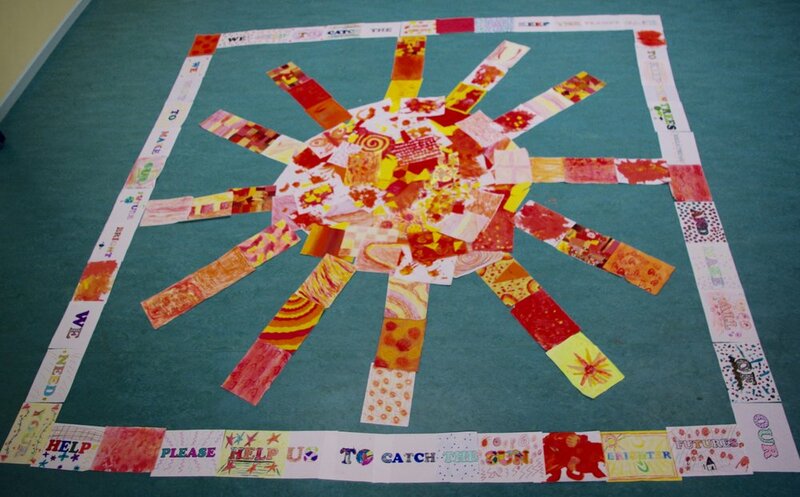 Up and down the country, our Solar Schools are always wow-ing us with their fundraising creativity and dedication. Now it’s time they wow-ed you. Because this week our schools hit £500,000! Read it, half a million pounds!! Since 2011 we’ve worked with 65 schools, and each team has made the project their own. From pupil-run conker shys, to sponsored bungee jumps to seven hour table tennis marathons, every penny they’ve raised has gone towards making their schools a cleaner, greener place. And as we come to the end of this year, there’s been plenty to celebrate from our current crop of solar schools. All Saints and St Richards primary raised £900 at their amazing pub quiz, Calstock primary have whacked out a fundraising event virtually every week, and Moorfield primary pupils pitched to a local business and received a whopping £10,000! And of course all our schools got creative to win some cash from Good Energy. It isn’t just about the money, because our schools have used the project to reach into the community, build networks and educate pupils and parents about the environment. A lot of dedication and hard work has gone into every solar project, so a huge well done to all the schools and thank you to the donors! Moorfield Primary in Widnes are the first superstars of the summer term! They've entered the last term of fundraising with a bang, securing a phenomenal £10,000 from a local business! When we first heard the news at Solar Schools HQ, we were pretty starstruck by their amazing fundraising efforts. We wondered how they'd done it - some sort of top secret mastermind plan, offering to endorse the business until the day the school closed, giving away excessive amounts of cake...? Nope. The students are the real superstars here! It turns out 4 pupils from the school just chatted to someone senior in the company about why solar panels were important to them. What an incredible achievement! 1) You managed to secure a phenomenal £10,000 in business sponsorship. How did you do it? 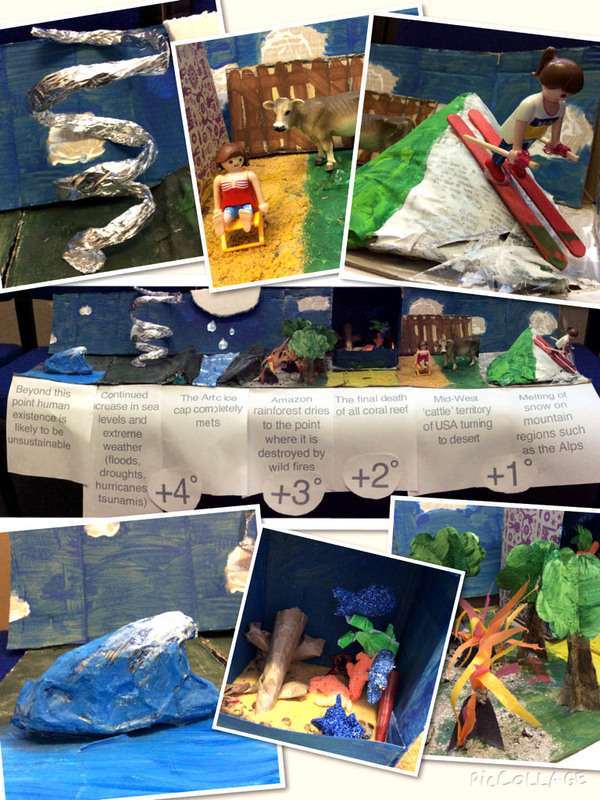 We have a group of year six's who have done a lot of climate change work in the past. We have a link with Liverpool university and we work on a green project together, so the children have done assemblies, presentations and stalls on climate change in the past. One of our local governors, Sue Fox, is also a senior in BYK Additives. When she visited the school, our group of year six's showed her our solar display and told her why they felt getting solar panels was important and why we needed the money. There were only 4 students, and they weren't scripted or guided by teachers on the day. I think that's what made it so special and made the company want to help us out - the students showed their own passion annd enthusiasm. They didn't use our words - they said it themselves. 2) What's been your favourite part of fundraising with Solar Schools so far? It has to be the connections we've built as a community. I've organised lots of events and the same group of amazing parents are there every time, from discos to race nights. After one disco, I was approached by a mum I'd never spoken to before - her child wasn't in my class and it never taught her child at all - and she said thank you. She explained to me what a great time her child had been having and that she was glad that staff wanted to get involved with parents. All schools want to build a community, and I think Solar Schools has helped ours to do that. I'm glad that as teachers we are building links with parents and families. We are out in the world - not just behind the classroom door or behind a desk on parents evening. 3) You have just £1,600 left to go. What tricks have you got up your sleeve to reach your target? We're excited for our summer fair. We're hoping to raise at least £1000 from that, so we will be practically almost done! We're considering organising a disco-race-quiz after half term too. We did all three events separately over the year, so we thought we'd bring them all together for one last fundraising push. We'd have a local dad DJ-ing, then pause the dancing every once in a while for a race, and there would also be a quiz on the table for everyone to get involved in. The last thing we're hoping is just to appeal to parents. We have so little money left - before their donation might have felt like a drop in the ocean, whereas now it really does push us ever closer to our target. 4) You're very active on Twitter. Do you think social media is important for community crowdfunding? though we didn't win the Good Energy competition, it really showed the power of social media. Our photo was liked by over 700 people - we don't know 700 people! The picture spread far and wide. The reach you get by using social media is unlike anything else, and the more people who know about your fundraising, the more people will potentially be engaged. 5) If the whole world were listening and you had just 140 characters to win their donations (and hearts! ), what would you say to WOW them? Join us and be a part of the difference we want to see in the world. Solar power for Moorfield, and everywhere. All Saints and St Richards Primary in Sussex who won £5,000! Georgeham Primary in Devon who have won £3,000. Calstock Primary in Cornwall who have won £1,000. A big well done to these three lucky schools who are getting a big boost to their totalisers. We'd also like to say a big well done and thank you to the other schools that took part in the competition. We loved each and every single entry and were impressed time and time again with your innovation in spreading the word and securing votes so we hope you are all proud of your efforts! We'd also like to say a special thank you to Good Energy for hosting the competition and giving our Solar Schools the opportunity to get creative! With the summer term now underway our schools are starting the final hurdle of their Solar Schools journey. They're closer to their targets than ever now so why not spare £5 to help them reach that final milestone and become green clean energy machines! If you have been admiring our Solar Schools page lately then you may have spotted a few donations to our schools from a party, organised by the ingenious Trillion Fund and the inspiring Vivienne Westwood. This wasn’t your normal party, It was a solar powered party with a large array of solar panels on the roof and a big battery to power the DJ through the night. The aim of the event was to encourage people to invest and support renewable energy projects across the UK, and Solar Schools was one of the lucky projects to be featured. Before you ask, no the schools weren't out partying, we were. Though, actually we weren't really partying, we were working hard to tell as many people as possible about Solar Schools and secure some extra donations for our hard working schools. Amy, from the Solar Schools team was invited to stand up in front of the wide eyed crowd for just 3 minutes to explain the project and encouarage the guests to donate to our cause. This was quite the ask considering that Solar Schools was the only project not offering a return on investment. But, as always she wowed the crowd with her enthused speech (personally, I think the scottish accent always helps too) to secure enough donations for each of our 15 new Solar Schools to receive £50. A welcomed boost to their fundraising efforts in these first few weeks. On the night, we also spent some time chatting individually to guests, telling them all about the project and asking them to wish our schools luck - by signing our chalkboard! Nicola Roberts from Girls Aloud, Lilah Parsons from MTV and world renowned snowboarder, Nicolas Müller were all more than happy to get signing. So, thank you to Trillion Fund and Vivienne Westwood for inviting us, thank you to the generous party goers who donated and thanks to the Solar Schools for being so marvellous. On July 4th, I joined an intrepid troop of year 4 students from St Bart's school in Brighton to venture to Dunsfold Solar farm for Solar Independence Day celebrations, courtesy of Solar Schools sponsor Good Energy. Sporting our yellow Good Energy tops - a very fitting colour for the location and the weather - we had a bit of a Q&A on the journey, where students answered all sorts of questions about solar energy, solar farms and general sunny facts. They were especially amazed that in just one hour, the earth receives more energy from the sun than we could use in a whole year! Just when I thought the day could well have peaked somewhat prematurely, we drove into the field and wonder ensued! "There were thousands of panels, all slanted!" We were joined by Mark, one of the Lightsource team who own the solar farm, who gave the students a tour of the site. He started with the basic facts, explaining the sun's energy through the medium of a solar powered grasshopper that danced when the sun hit it, naturally. We were then lead round the farm, learning all about the panels and exactly how they work, why they're slanted (this allows them to absorb more of the suns energy), what the big yellow boxes do (invertors which make the energy produced suitable for our elecricity grid) and the purpose of the fans - turns out we weren't the only ones at risk of overheating! "When it's overheating they turn it down - there's a fan in the yellow box." Sheltering from the midday sun under the panels, we ate our lunch before learning about the biodiversity of the farm. Mark explained that the solar farms don't just generate huge amounts of clean energy, but they're working hard to be important spaces for biodiversity too. Plus, we learned that some farms provide grazing space as well as electricity, for sheep and even alpacas. "The sheep lie under the panels for shade." It was a great day out for all, there's nothing like a dancing solar bug and some sunshine to amp up the learning! In fact, the pupils loved it so much that once back on the bus they declared it 'the best trip ever". High praise indeed! Fitzmaurice fly over the finish line! On the 22nd October 2013, the team at Fitzmaurice primary launched their Solar Schools efforts with a whole school assembly. Now, just eight months later, they've engaged their entire community, featured in the Bath Chronicle more times than you can count and most importantly, reached their £16,000 target. Actually, they haven't just reached their target, they have flown over it with £17,000 now in the bank and more coming. We thought it only fitting to give them one more shot of the Solar Schools Superstar crown to celebrate! Richard Craft, one of the team coordinating the project at the school, took some time off from firing party poppers to talk to us about the project and what it feels like to be finito. You're finished! First things first, how have you and the team been celebrating? sometime over the next few weeks; we'll have a grand opening when the installation has taken place and invite all our sponsors and donors etc. There is a school picnic after school on the last day of term, so we'll probably do something then as well. I did a little spot this week with the children in assembly - ceremonial placing of the last few stickers on our "Solar School Pole" that has been in Christine's shop. As your final fundraising event of the year you had an amazing auction of promises which raised over £3,500. What was on offer on the night to make this possible? So many things to list! We had over 65 lots on offer from all sorts of people in the local community and beyond. The highest grossing bid went for a date with Gavin Henson, and went for a whopping £910! 4 nights at Shooting star Lodge in Zanzibar went for £220. Others lots included a coaching session for 30 kids with Lewis Moody 4 hour canal drip, tickets to the Eden project, a trip to the local cinema in a limousine and a cake a month for a year! You've really mastered fundraising, social media and press this year. What advice do you have for new schools joining the project, to help them fly ahead, just like you? Number one is to be totally committed to the idea; it won't just happen, you have to put in a lot of energy and thought into it; if you do this you'll be surprised at the response you get from people you've never even heard of before. 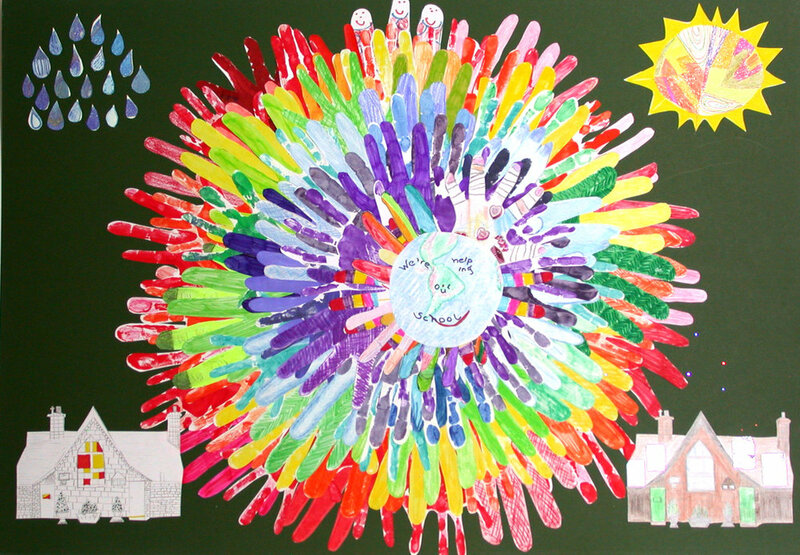 Get a good team around you, making sure one is an enthusiastic school governor and another an equally enthusiastic member of the Parents Association with different skills and strengths (identify these first), keep it fluid and not too formal and have fun. We had a few meetings at the start but most of the work and organising was done by e-mail, phone and the occasional coffee. Identify where you're going to advertise and who's going to do what - we used Twitter, Facebook, local weekly papers (Wiltshire Times and Bath Chronicle), local monthly community newsletter The Gudgeon, local climate change newsletter (I happened to be the one who writes it, which is a great advantage!) Most of all, don't be too precious in the team about the role you have, cross fertilisation is good and paths often crossed but nobody got upset, we just put it down to enthusiasm and never lost sight of our aim; bickering/moaning just saps energy and diverts you. Just eight months of fundraising has seen 150 donations uploaded to your website - What would you like to say to your donors and supporters? A massive thank you for their support. It's a project that will benefit the whole Bradford on Avon community, not just the school, in their quest to become Carbon Neutral by 2050. You have made a very positive contribution to the local community and the planet in general! The school pupils have really thrown themselves into the fundraising efforts this year, do you have any pupil highlights to share with us? The way they (and their parents and staff) engaged in the 'Sunhats and Shades' non-uniform day on a miserable wet and cold day back in February. The way all the children responded to the renewable energy day during the school science and technology week when we were able to bring local experts in to the school to speak to the children; Kevin's Tesla electric car being driven in the playground was a huge hit - and Kevin loved it as much as the children! Organised as ever, you already have your installation plans in place. Do you have any advice for other schools as they begin the search for an installer too? Get 'ball park' quotes right from the start, as soon as you are accepted onto the scheme. This gives you a strong indication of how much you need to raise and a good installer will be able to look at your roof and identify any potential roof issues right from the beginning. Find out if you have any 'experts' in the community who could advise you and even recommend installers. We are lucky in the Climate Friendly BoA is well ahead of the game and knew of several installers. What are your top tips for getting the whole community involved in the project? Try to dream up events that anyone from the town can take part in and invite them along, as with the Table Tennis Marathon - Town Council, other schools, sports clubs, Preservation Trust, Chamber of Commerce, etc. We were lucky in that Christine's Sustainable Supermarket is smack bang in the middle of town and became very much the focus for people not directly involved with the school - she put up posters for us, displayed the 'Pole' in her window and had a collection box on her counter as well as a very persuasive manner!!! If your town/village has a climate change group or is a Transition Town, get them involved right from the beginning to work out what they can do to help you. They will be only too pleased to be asked to contribute to a project that totally fits their aims and objectives. What has been your overall highlight of the Solar Schools project? The sprint to the finish line once we'd passed the £10,000 mark, it all happened so quickly it was just a blur and seemed to be all over in a flash. Any uncertainty over whether we would reach the target just evaporated and we became 100% confident we'd do it. Also the number of new people I've met, in a very positive way - parents, town residents, organisations, etc. You have 5 words to describe the past 8 months - go! Fun, exhausting, exhilarating, entertaining, rewarding. Solar Schools is all about getting the community involved and Fitzmaurice have gone above and beyond to do so a truly amazing effort from the team at Fitzmaurice, the students and the local community - CONGRATULATIONS, enjoy the champagne team! 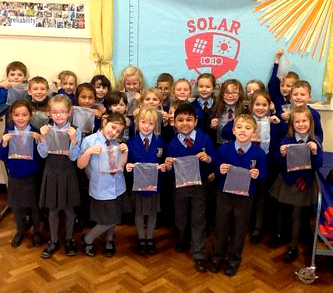 On Friday the 20th June, children at Ilmington primary in Warwickshire and St Vincent’s in Liverpool were showered with praise and applauses in the first ever Solar Schools awards. Best Individual Pupil Effort: Innovative rapper, Mahmood at St Vincent’s. On the day itself, Amy and I jetted (trained) off to celebrate with the schools and award them with their special certificates and Solar Schools medals – yeah that’s right, MEDALS! Amy had the pleasure of visiting the fabulous team at St Vincent’s, Liverpool, where they're using the Solar Schools project to prepare and educate their students for green jobs in the future. Our worthy winner, Mahmood Hansroot is the perfect example of that in action. Mahmood, who is both visually and hearing impaired, has excellent communication skills which he wanted to put to use to great use - raising awareness about the Solar Schools project at his school. Demonstrating a whole host of employable skills, he teamed up with local band Ukebox and staff from Capita to create this rapping masterpiece. With hundreds of YouTube views already under his belt, Mahmood is hoping his efforts will lure in the donors and take St Vincent's closer to their target. Whilst Amy was venturing up north, I went out west to Warwickshire (and got quite the grand tour, stopping by the tallest point in the county!) to visit the delightful Ilmington Primary. Anna Pike, project coordinator at the school, had nominated the year 6 students for their incredible efforts. 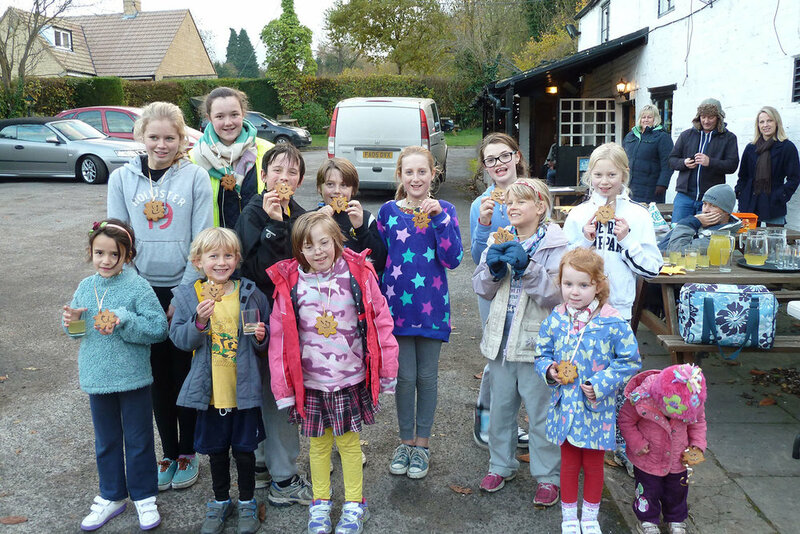 They organised their very own sponsored swim and a biathlon which saw them run around their village for over an hour – no mean feat! Combined, these events raised over £2,000! Parents, donors and local community members had all come along to celebrate with the children and enjoy some of the delicious Solar Schools cakes on offer. Anna, the project coordinator at the school, and I handed out the students certificates and medals and listened to the amazing nomination poem – an ingenious way to fill the 200 word limit for nominations. One dedicated student even hobbled up to the front of the class on her crutches – she got an extra round of applause for that! Having hit their target, Ilmington are in the process of finalising their installation – exciting times! If all goes well, they'll be installing over the summer so their panels can start lapping up some of the summer sunshine! Both Amy and I had a great day celebrating with the pupils, staff and community members that joined the day. A huge thank you to the schools for taking part in the day, inviting us along and just being so wonderful. We’ve loved watching you progress this year and look forward to seeing those panels go up soon! Round of applause for Mahmood and the year 6’s please! Ilmington’s student led success earns them the prestigious “Solar Schools Superstar” title! We’re very happy to announce that the wonderful Ilmington School in Warwickshire is our Solar Schools Superstar this week! Ilmington is a small village school with just 103 students, but demonstrating that age-old adage of quality over quantity, these pupils are powering the project forward towards their £17,000 target! Since launching just a few weeks back, they’ve already challenged themselves with a sponsored silence and a cake bake. Sam, aged 6, donned his wonderful wizard outfit and set up an innovative conker shy that raised £56! Events in the pipeline include a student-led sponsored swim in January and a school-led sponsored football shoot-out. Their most recent event was a fabulous biathlon which raised over £1600, pushing them over the £2000 milestone! 15 parents and friends cycled 50 long miles and 12 children ran around the village for an hour. Tom (aged 10), Joe (aged 6) and Charlie (aged 11) ran solidly for the whole hour – they deserve some extra applause I think! 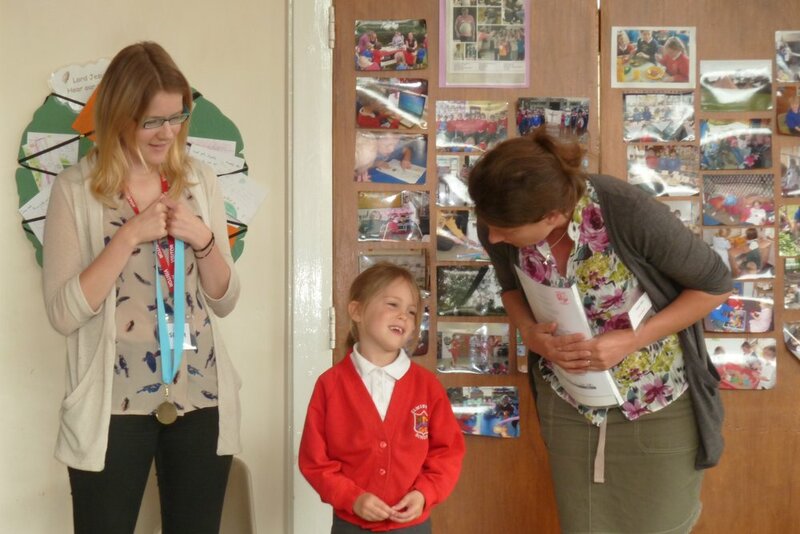 Naturally, everyone was rewarded for their efforts with some biscuit sunshine medals - delicious! What was your incentive to join the Solar Schools project? We wanted to feel like we were doing something good to reduce our carbon footprint and get the next generation involved at the same time. I have three children at the school and I felt the Solar Schools project would enable them to get incentivised and excited about a topic that will be so important for them in the future. What has been the highlight of your Solar Schools experience so far? Having wanted to get involved in this project to excite the students, I am pleased to say that my highlight has been their reaction. I introduced the project in an assembly and later received an email from a mum informing me her child had described me as ‘a hero’. This shows just how enthusiastic the children are. They’re organising their own events all the time, ice cream sales, cake sales, running in our recent Biathlon and all credit must go to them for their astounding enthusiasm. How have you been spreading the word at Ilmington? Ilmington is a small rural village so it has mainly been through word of mouth to individuals, rather than through businesses at the moment, although, the local pub has pledged its support! We have printed information in the parent’s newsletter and are enjoying sharing our stories on Facebook and Twitter. If you could give one tip to a new Solar School, what would it be? Don’t give up! In spite of the barriers, especially if you’re part of a small team, just keep at it! We’re not there yet but we definitely will be soon! If the whole world were listening and you had just 140 characters to win their donations (& hearts), what would you say to WOW them? The 103 kids at Ilmington School are bursting with enthusiasm trying to raise money for solar panels, please help them reach their goal! That’s all from us, but well done Ilmington, keep up the good work! 1000 pupils skipping, skating and scooting towards solar! This Friday 5th, around 1000 children across England are scooting, skating, skipping and staying silent for as long as they can in aid of bringing clean energy to their school! 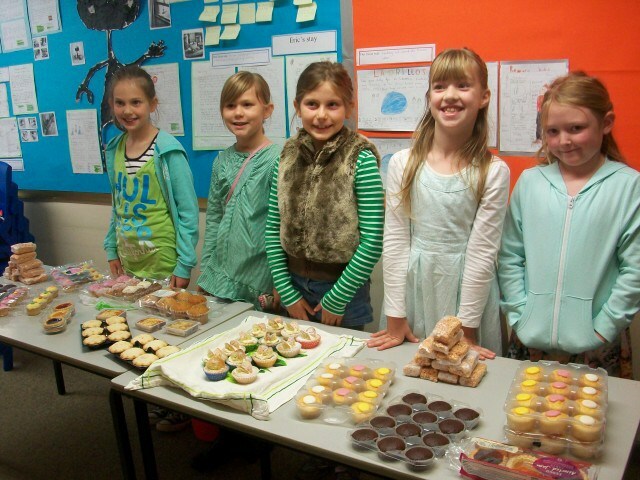 The pupils from Little Kingshill Combined School, Courthouse Junior School and New Mills Business and Enterprise College will be calling on relatives and friends to sponsor their efforts and help raise the cash they need to take their school a step closer to their fundraising target! After a year filled with bake sales, bungee jumps, business support and bingo nights, the children taking part are hoping that Friday’s fun might just allow them to join our rapidly rising number of finishers! Since launching last October, the 29 schools taking part in Solar Schools this year have collectively raised over £140,000. With the end of term now just weeks away, they’re hoping to stump up several thousand more, allowing them to install solar panels over the summer. Each school taking part uses an innovative combination of online and offline fundraising techniques to hit ambitious targets, while at the same time bringing their whole community together to learn about energy and climate change in a totally new way. This Friday, three of those schools are hosting sponsored events in tandem. From whole schools of skipping students to handfuls of silent teenagers, the pupils will be challenging themselves to do their bit to help their school tackle climate change. Break out the sun dance, we have our first finisher - Barnes Primary School! Every donation added to the Solar Schools website takes a school closer to becoming a flagship for clean energy in their community. And each new face proudly displaying their support is just the tip of the iceberg in terms of the huge amount of activity going on at all of our schools. So, it makes sense that each time a new supporter, business or event appears it's cause for celebration. But, some donations come with just a little more fanfare than others. On Wednesday 23rd January, after 14 weeks of hard work, incredible community buy-in, and a string of events that would put Time Out to shame, Barnes Primary uploaded the profits from a snowy sponsored run and smashed through their fundraising target! We now have the first finisher of the national roll out, and they couldn't be more thrilled with the support the project has been shown. Solar Schools provides the training, support and resources that teams at schools across England and Wales need to crowdfund the cost of installing solar panels. Dedicated volunteers attend trainings, trawl through 'how-to-packs' and get to grips with their page on the Solar Schools website... and then the hard work begins. So just how did Barnes do it? They made it easy for everybody to get involved. From regular communcations, through inclusive events to loose change collections, absolutely every pupil (and hopefully parent) at Barnes has been given the chance to be part of something incredibly exciting. Through Solar Schools (and 10:10), we provide the tools and support people need to make things happen in their communities. Barnes are an incredible example of taking those tools and applying them in a way that works for them. It's the same approach that we can all take to carbon cutting - we can't do everything, all of the time, but we can make strategic decisions towards doing our bit. So, what does hitting a fundraising target mean - for Barnes and maybe, even for you? Well firstly, it means that before this summer (and all the sunshine that will bring... fingers crossed), a primary school in Richmond will start to cover a proportion of their electricity requirements with homegrown clean energy - a feat made possible by the support of the pupils, parents and community around them. The subsequent electricity bill savings and Feed-in Tariff payments the school will receive for the next 20 years, can be gratefully ploughed straight back in to the school, cushioning them against ever shrinking school budgets. And what of those cute pupils? They've witnessed first hand what can be achieved with hard work and passion. Now they get to learn in a little microcosm of positive action on climate change - a case study of the progress communities are taking towards a more sustainable future. And for you? We hope that Solar Schools is just the beginning. The team at Barnes have worked their socks off on top of demanding school schedules because they care about the future of their young people - at school and beyond. Now, each of us can do our bit to ensure that those pupils grow up in a sustainable, low carbon UK - by reducing our own demand at home or at work, creating our own renewable power or keeping the pressure on parliament to clean up our ageing electricity grid. 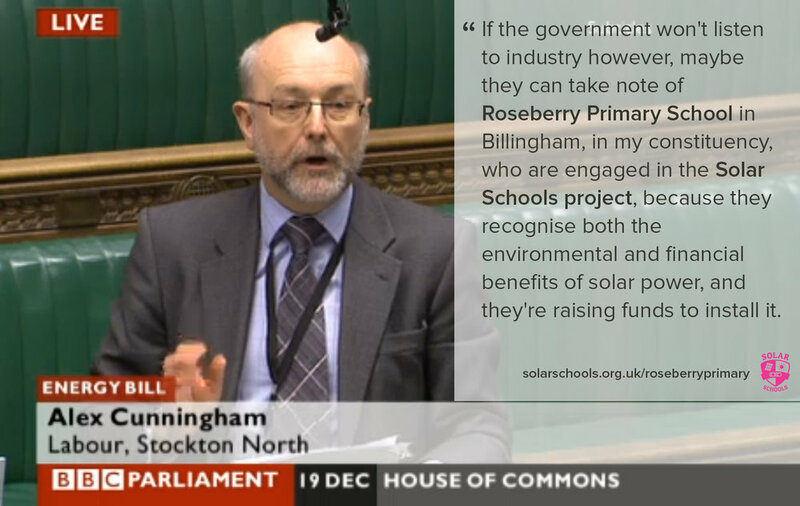 Roseberry Primary School gets a parliamentary shout out! Solar Schools is all about demonstrating that across the UK, people are ready to show the kind of passion and commitment that's needed to create a more sustainable future. So, we were absolutely thrilled to see one of our schools - Roseberry Primary School in Billingham - getting the kind of recognition their hard work deserves. Yesterday, during the second reading of the hugely important Energy Bill, their MP, Alex Cunningham, called on government to take note of Roseberry when considering the choices they make about the UK's energy future. The Energy Bill has a big role to play in securing a clean energy future for the UK, but without strong demonstrations of support for renewables from their constituents, MP's won't call on government to make the bold decisions we need. Thanks to Roseberry, not only did Alex Cunningham MP have a great example of clean energy in action, but he was able to speak up knowing he was representing the concerns and passions of his constituents. From raffles at the Three Horseshoe Pub to mentions in parliament - Roseberry Primary are spreading their sustainable message everywhere and setting exactly the kind of example we, and government, need. Some massively well deserved, festive congrats from all at the Solar Schools team! In September we set ourselves a challenging fundraising target of £10,000 to allow us to install solar panels on the roof of our school. We’re very pleased to let you know that we’ve smashed our target and to do this just before Christmas is even better! Taking this leap was always about engaging the community and the environmental and educational benefits of the Solar Schools project for our pupils. We’ve been amazed by the generosity of all our donors and thanks to the collective effort of the community, we’ve reached our target quicker than we could have expected. It’s been the most phenomenal morale boost for our school and community. A huge thank you to all those who took part. Barclays - Thank you to Barclays for supporting us and fundmatching our Quiz Night. Sussex Police Property Fund - Thank you to the Police Property Fund and our local officer for nominating us. Eco Committee Recycling Competition Winners! Easter Art & Crafts at Greene & Co. Dress Up for Blue Monday! Folville staff vs. Leicester City ladies match! Jemma Morrell and her mum and dad!